NICE (National Institute for Health and Care Excellence) recently won our 2016 SORCE award for most engaging intranet. We are delighted for them to have won and we think their story is one that we could all learn from. NICE provides national guidance and advice to improve health and social care. With over 700 employees based in London, Manchester and homeworkers, their new intranet had an important role to play in connecting people and encouraging collaboration. SORCE started working with NICE in 2014 and were excited to be part of their solution. Emily Hughes, NICE’s Internal Communications Manager has kindly agreed to an interview so we can find out how they achieved success. 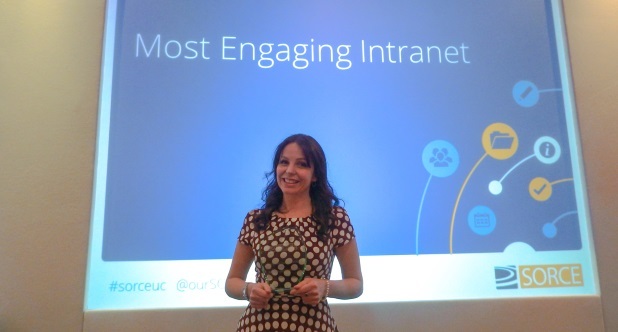 Congratulations on winning the award for most engaging intranet! Finding out what people want from their intranet is always tough. How did you go about uncovering your requirements and what did you learn? We held a series of interviews with colleagues from across NICE and distributed a survey to everyone. 33% of people responded which was a really good response rate for an employee survey and showed that everyone was behind the new intranet and were keen to get involved. Everyone commented on the look and feel and we quickly learnt that our new intranet needed to have a very clean design, making it speedy to navigate and search. The noticeboard much requested feature and it provides a great community area. People were unsure of what they should be blogging or saying on the intranet. Because of this, not as many colleagues were contributing content as we would have liked. Quick ways to engage and tell us what they think were high on the requirements list. Not everyone had the time to write feedback but if we could provide them with ways to engage they would get involved. You had some great feedback on everyone’s requirements, how did you take these on board and what did you deliver? The feedback we received was really clear and we made sure we incorporated the wave of enthusiasm in everything we did. From choosing the name “NICE Space” via an organisation wide naming competition to planning a full Space themed "Lift Off" launch. We launched a fully responsive site in June 2015 with a great community noticeboard and lots of social elements, such as voting, rating, comments and blogging. We also produced some guidelines on how to blog and also shared our own blog plans with everyone. We are delighted with our new intranet and we have just celebrated our 1st birthday with a bang! We held a content contributor of the year awards competition, invited everyone to complete a user survey and we even held a virtual 1st birthday party! Our birthday party included colleague’s videoing themselves saying why they love NICE Space. What’s next for NICE Space? We have learnt a lot about how our intranet can help engage everyone. On our to-do list we would like to refine our search and review the accessibility of the site. We are always keen to get more teams using their pages and grow the social elements. Ultimately, I would love the intranet to replace the dreaded all staff emails! If you would like to find out more about NICE implemented their new intranet NICE Space, you can download their case study.